It’s been on hold, because I’ve been wanting to play other games lately, but the 3rd Nightmare is coming back for Extra Life. Last we left off, I finally made it to the final chapter, and was bashing my head into the nightmare level arena. Whether I do complete the arena or not is still in the air- though I do want to! But we’ll see if I can get much progress on the game in two hours. Simple enough- this will be a blind playthrough of Breath of the Wild’s challenges and additional features with its DLC bonus. Will I actually complete them, or will I be eternally distracted? Considering this game, that is actually a possibility…. I will, of course, be dusting off Oath in Felghana in Inferno mode. I will probably pick up a few more pushes of this on the Extra Life channel on twitch leading up to game day, so perhaps I’ll be at endgame of this when the stream hits! Anything goes in this block, Super Nintendo, Nintendo, you name it! While I’m getting Ys VIII in English on Sept 12, I doubt I’ll have time to play it before Sen no Kiseki III comes out, with my current schedule of games. As such, I’ll begin a new game on Nightmare during this block, and see the English translation for the first time with it. However, there is a chance that this may become Inferno? Check out the stretch goals for details! I’m not playing an Uncharted game at launch? What’s wrong with me? A schedule, that’s what. This game is being added in for an initial playthrough during Extra Life, which will probably become a series of streams to finish it after game day. When Sniff heard that I hadn’t played Crystalis, it was then decided that not only would I do a blind playthrough on twitch, but that he would be sticking around to provide commentary. This should be an adventure and a half! As per tradition of Extra Life, let’s get on some multiplayer shenanigans with Sentinels of the Multiverse! If you want in on this, give me a heads up prior to game day! I’ve been promising this for quite awhile, and it’s actually happening. The game will be added into my ‘currently streaming’ list after game day, as well. The xenomorph returns- and in the middle of the night, no less. When I’m tired, nerves will be frazzled, and this will provide the adrenaline to keep me going through the early hours of the morning. Jump scares will definitely help, I assume. Noise detection will be active again, as well. oh boy…. Keeping up with the adrenaline fest to keep me awake in the overnight hours, I will pick up on WipEout and racec for two hours, trying to complete tasks and trials. During my last two hours, I’ll spend time putzing around in FFXIV, and possibly doing roulettes and griping about healing bad tanks. It’ll be a good way to cool down from the adrenaline rush from 2am ~ 6am. We all know I have a love-hate relationship with the Lords of Shadow games. I played Lords of Shadow 2 to raise money for Firehawke earlier this year, and- unlike its predecessor- I actually finished it! Once I knock Mirror of Fate out, I’ll have the games complete, for the most part, and can put them behind me. 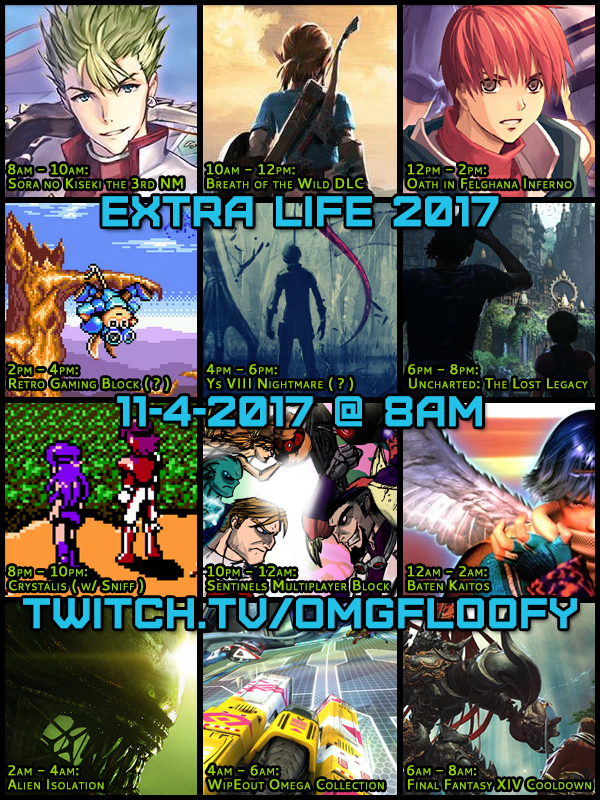 This will end up being a stream leading up to Extra Life at some point. 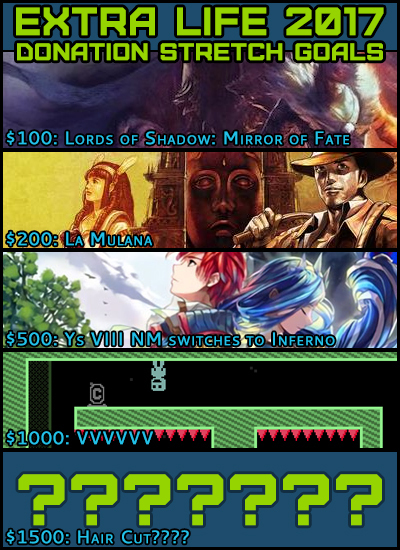 La Mulana is a game I intend to play anyway, but if I hit the $200 stretch goal, this game will jump in and replace my ‘Retro Gaming Block’ from 2pm to 4pm on game day, and the game will be shuffled into my ‘now playing’ list. As you can see in my schedule, Ys VIII Nightmare is listed already. I plan to pick this up on the NA release, so I won’t have any of the additional functions and bonus items from having purchased both PlayStation 4 and Vita versions of the game. However, as this will be on the PS4, the option to play on Inferno will be there, too. At $500, you can make my run jump from Nightmare to Inferno. Thanks to both Firehawke and Seizui, I have this game now. 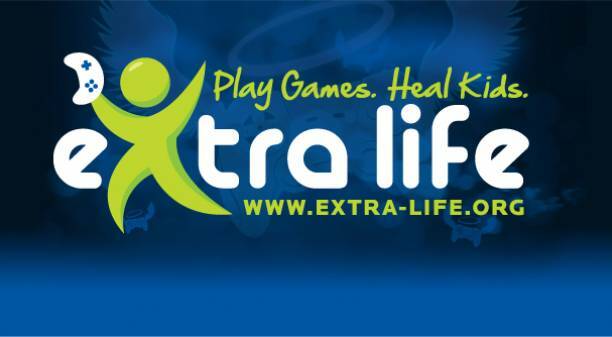 A special stream of this game will kick in if I hit $1000 in donations. This is the big one. If I hit $1500 before game day, I will actually cut my hair. It means I’ll be shaving it down to be extremely short– shorter than I’ve ever had it, even. Probably down to a buzzcut or peachfuzz look. It’ll be a conversation starter at least!